Even if you purchase a large amount of organic food, you may not have thought too hard about buying organic tissue paper. After all, you're only going to blow your nose on the tissue paper or use it to stifle a cough, why should it be organic? However, there are many organic experts who say buying organic tissue is just as important as buying organic food and drinks. Others say, organic tissue is a luxury and that recycled tissue paper is best. Perhaps you thought personal paper products did not even come in organic form, but today all sorts of items are sold as certified organically grown; from clothing to toilet paper. Tissue paper can contain organically grown ingredients when it's made with cotton. Manufacturers turn the organic cotton into tissue paper through a process that does not use chemicals. A big pro for many individuals is that tissue paper that's organic is ideal for sensitive skin. The tissue paper is free of inks, dyes and perfumes - and these are the main irritants of sensitive skin. When individuals with sensitive skin get sick or have an allergy flare up, they need to use tissues quite often. After several uses, non-organic tissue paper can cause significant irritation to the area of skin around the nose. Many people with sensitive skin love organic tissues for this reason.Even individuals without sensitive skin report liking the organic kinds of tissue paper. Organic tissues are incredibly soft - and this is a very good quality to have in a tissue paper when you have a cold or allergies and must continually blow or wipe your nose. Many people also think a big benefit of organic tissue paper is the positive effect it has on the environment and society. The Kyoto Protocol calls for consumers to buy organic personal paper products as they promote sustainability and healthy farming. Some also point out that organic agriculture is crucial to reversing global warming. Furthermore, organic enthusiasts use the theory of supply and demand to encourage consumers to go organic when it comes to tissue paper. If consumers buy more, manufacturers will make more and thus organic practices eventually become industry standard. Some sustainability experts are adamant about not using organic tissues since they still contribute to massive waste. These experts say consumers truly concerned about our planet should opt for recycled tissues. These tissues are created from clean, but used papers of all different kinds, reducing the total carbon footprint of tissues. 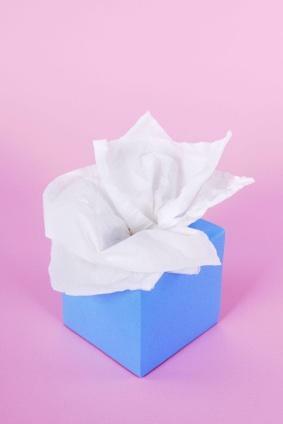 These tissues are not organic, because they're made from reused, non-organic materials.One brand in particular, Seventh Generation, has produced a very popular recycled tissue paper that is becoming widely used. It's made from 100 percent recycled materials, 80 percent of which is post consumer waste. Critics also say that organic tissues are more of a luxury item, good for those with extremely sensitive skin. This is because organic tissues are much more expensive compared to non-organic and recycled tissues. They also point out that those really wanting to cut back on waste and costs should use washable cloths as tissues. If you would like more information to help you decide you might like to do some research on the Internet. Greenpeace has recently issued a consumer's guide for buying recycled personal paper products. Organic tissues do promote an organic way of life that is beneficial to all. However, if you do not have overly sensitive skin and need to save money, consider using recycled tissue paper or handkerchiefs instead.